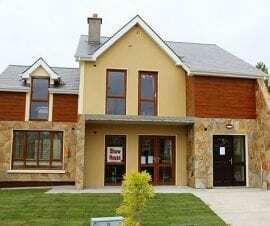 Abbey property sales are delighted to offer to the market this stunning natural stone faced home in Croghan. The property is located in a small development of 11 homes. No 11 is an end house with a large site and backed up by a natural stone wall to the rear. The property has access to both sides of the house and a driveway to the large 6m x 4m Steel Tech Garage to the rear. This is a truly wonderful home with quality tiling throughout, Solid oak kitchen and Utility room, Granite work tops in both rooms, Dual heating with Oil Condenser boiler and a lovely Stove in the sitting room, Alarm system, Large corner site, Garage, Close to School, GAA grounds, Church, Creche, Double glazing, Solid wood flooring downstairs and Quality carpet on the first floor, 2 Ensuites fully tiled, 10 min to Carrick on Shannon and Boyle. Entrance Porch. 10′ 1 x 4′ 2. Lovely bright area with quality tiling. Ent Hall. 14′ 2 x 10′ 2. Lovely bright hall with quality tiling and stairs to first floor. Kitchen/Dining room. 25′ 2 x 12′ 3. This large bright room has a solid oak kitchen with granite worktops, Built in Dishwasher and Fridge Freezer, Double oven and hob, Quality bright tiling, Oak doors and architrave, Double door to side of house and ample recessed ceiling lights. Utility Room. 10′ 2 x 5′ 2. Lovely utility room with solid oak units and granite worktop, tiled floor and back door. Sitting Room. 25′ 1 x 12′ 2. This lovely large sun filled sitting room has a solid wood floor, Feature fireplace with stove for heating the house and water, double doors to the rear patio and 4 windows. Sun room. 13′ 1 x 9′ 2. Lovely bright room to the rear with double doors to the patio, Solid wood flooring. WC. 5′ 1 X 4′ 2. Lovely fully tiled room with WHB & WC. Quality tiling. Bedroom 1. 13′ 1 x 12′ 2. Large bright room with quality carpet and built in wardrobe. Ensuite. 8′ x 5′. Lovely fully tiled room with shower, whb & wc. Bedroom 2. 13′ 1 x 13′ 2. Lovely large room with quality carpets and built in wardrobes. Ensuite. 8′ 1 x 4′ 2. Fully tiled room with shower, whb and wc. Bedroom 3. 12′ 1 x 12′ 2. Built in wardrobes and quality carpets. Bedroom 4. 12′ 1 x 12′ 2. Built in wardrobes and quality carpets. Garage. 19′ 8 x 13′ 2. Large steel tech garage. 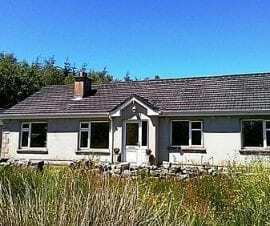 This is a truly lovely quality home in a great location. 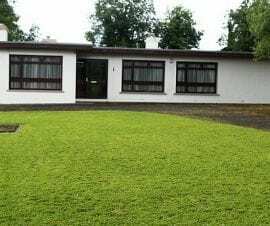 Call Gerry on 086 8066701 to arrange a viewing or for further information.